In Seattle, early spring thrills as cherries, rhododendrons, dogwoods, and other spring-flowering trees and shrubs come into bloom. But how is your garden faring now that summer has arrived and with it a long string of dry, warm, sunny days? Does it look tired? Are you nostalgic for those spring flowers and feel there is nothing more to anticipate? Well, think again. 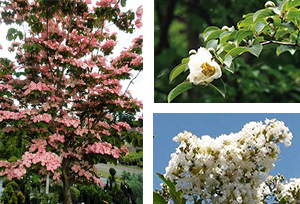 This article suggests some outstanding trees and shrubs that flower during the warmest and driest summer months. Lavender mophead flowers of Hydrangea macrophylla ‘Nikko Blue’ begin blooming in early to mid summer. Hydrangea macrophylla ‘Lanarth White’ has white lacecap flowers from early summer through September. Rough-leaf hydrangea (Hydrangea aspera Villosa Group) flowers in August and September. Number 1 on any list of summer-flowering shrubs has to be hydrangeas. Generally, hydrangeas are neither sun-loving nor drought tolerant, but when sited in light to open shade and mulched well, they should not send your water bill skyrocketing, nor drain any reservoirs. Among the best hydrangeas for summer flowers are big-leaf (Hydrangea macrophylla) varieties, which have flowers in either mophead or lacecap arrangements. 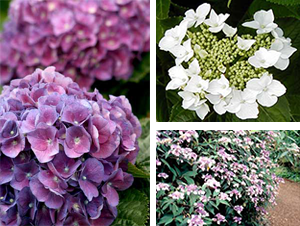 Mophead hydrangeas have large clusters (“mopheads”) of flowers, while the lacecaps have a more delicate (“lacy”) flower arrangement. Others hydrangeas worth pursuing are the treelike Hydrangea aspera, with its large, felty leaves; Hydrangea arborescens, with huge, rounded flowerheads; and Hydrangea paniculata, which can take more sun than most. All of these delight long into the fall season as well. The June flowers of Cornus kousa ‘Satomi’, a pink form of disease-resistant Korean dogwood, are followed by strawberry-like fruits in August. Stewartia pseudocamellia produces camellia-like white flowers in midsummer. Lagerstroemia indica ‘Natchez’ is one of many varieties of summer-flowering crape myrtles. Long after the excitement of flowering cherries fades, other choice trees come into bloom. Two of these, Stewartia pseudocamellia and Stewartia monadelpha, produce white, camellia-like flowers in June. These and other species of stewartia are lovely in flower, but they are also attractive year-round for their bark, form, and fall color. Flowering around the same time are many varieties of Korean dogwood (Cornus kousa). Unlike the ubiquitous white and pink forms of Eastern dogwood (Cornus florida), the later-flowering Korean dogwoods are disease resistant. Ornamental strawberry-like fruits follow the flowers, and the leaves turn strikingly red and orange in fall. Varieties of Crape myrtle (Lagerstroemia indica) are widely planted throughout hot summer areas of the United States, particularly in southern states. Cultivars vary in size, form, bark, fall color, and disease resistance, but all are perfectly hardy in Seattle. Like tomatoes, some cultivars flower earlier than others, and the earlier-flowering varieties are the ones most likely to produce showy flowers in the Pacific Northwest, which has cooler summer temperatures than many other areas of the United States. A sheltered, sunny, heat-absorbing site offers the greatest likelihood of flowering. Flower colors differ widely by variety, from pure white to deep pink, magenta, and lavender. 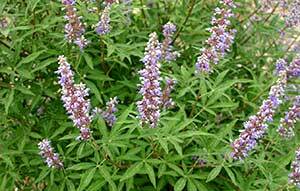 Summer-flowering Chaste tree (Vitex agnus-castus) has fine, aromatic foliage. Chaste tree (Vitex agnus-castus) is a true Mediterranean native. A large shrub with lacy, aromatic foliage, it is sun-loving, deer resistant, and produces spikes of lavender flowers in late summer, continuing into fall. Its extract is used medicinally for hormonal maladies, mostly in women. Chaste tree is one of the last plants to leaf out in the spring, but it is worth the wait given the pleasure it provides into the fall season. Similar to the Chaste tree, Bluebeard (Caryopteris x clandonensis) is drought and heat tolerant and deer resistant. The variety ‘Dark Night’ reaches only 4 by 4 feet and has dark green, aromatic foliage and deep purple flowers beloved by hummingbirds and butterflies alike. Would You Prefer Something Heavenly Scented? 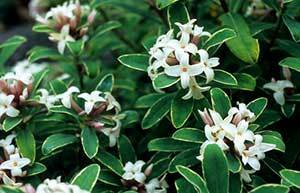 The perfume of Daphne × transatlantica ‘Summer Ice’ can waft through your garden for up to 6 months! Nothing is as magical as fragrance, and daphnes are among the most fragrant of flowering plants. Several varieties flower throughout the summer. The sweetly scented Daphne × transatlantica ‘Summer Ice’ has small, variegated gray green leaves and flowers from April to November. At only 3 by 3 feet, Daphne × transatlantica ‘Eternal Fragrance’ produces soft pink flowers in spring that continue into summer and fall. The similarly sized Daphne tangutica has shiny, deep green leaves and produces tubular, pale pink flowers in spring that often continue throughout summer. 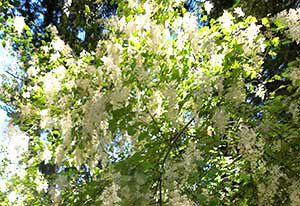 The lilac-like creamy white flowers of Ocean Spray (Holodiscus discolor) are lovely along the trail, and in your border. If it were not midsummer and I hadn’t been walking the trails of Fort Worden State Park in Port Townsend, I would never have thought to include our native Ocean Spray (Holodiscus discolor) in this article. Easily dismissed as a homely shrub at best, the loveliness of its creamy white lilac-like clusters at peak flowering is unparalleled and gave rise to it eponymous common name, Ocean Spray. Indeed, I just saw it used to stunning effect in a manicured border while touring gardens on Vashon Island. Nurseries are clever marketers and offer plants when they are most likely to captivate consumers. A good nursery should carry all of the summer-flowering selections described in this article when they are at their most appealing. If you want to get ahead of the game, landscape designers and other landscape professionals can source plants for you before they reach their full glory, enabling you to have them in place when they come into bloom and beyond.